Occasionally we get to step outside the usual San Diego Wedding photographer box and do something unusual. Sometimes, that comes as an opportunity to work with a magazine as the catalyst to do this. 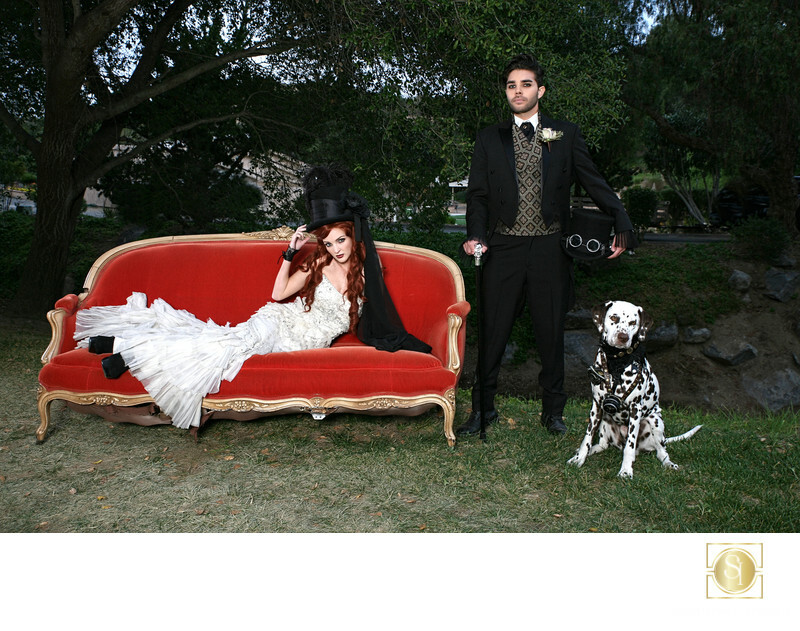 In this case, a staged Steampunk wedding even included our dog as a bandanna wearing, monocle sporting Dalmatian mascot! We got to work at Los Willows Wedding Estate with our friend Alexia Petre for makeup, Flour Power for cakes, Rickety Swank for furniture and props to put together an amazing set of images for San Diego Style Weddings Magazine! Shot with a Canon 5D mkIII, two 750 w/s Bowens/Calumet monolights with unbrellas. Keywords: best wedding photographer (3), Los Willows wedding Estate photographer (30), San Diego Wedding Photographer (564), steampunk wedding (3).